Migraine headaches are the most common acute and recurrent headache pattern experienced by children. These often incapacitating experiences are noteworthy for their sudden onset and accompanying symptoms of nausea, abdominal pain, vomiting, and relief by sleep. Doctors focus on ruling out other serious diseases or conditions when they first examine migraineurs (people who have migraines). Treatment consists of finding and avoiding trigger factors in the environment, giving immediate pain relief, and taking preventive drugs. Migraineurs may present with an array of various signs and symptoms. During a migraine episode, patients often endure the sudden onset of a severe headache located around the eyes, in the forehead region, or in the temples. Some children experience vision changes or other sensory changes ("auras") during or proceeding a headache. A sick feeling in the stomach or vomiting is common. Many children avoid bright lights, loud noises, or strong odors since these may amplify the pain of their headache. While various medications may be employed to treat a migraine headache, the severe head pain is often completely relieved by deep sleep. An inherited tendency is believed to make some people more likely to have a migraine after some minor trigger, although no single theory explains how the human body produces all the symptoms of a typical migraine headache. Emotional or physical stress, the onset of an illness, and/or certain foods or liquids may trigger a migraine headache. One rare migraine presentation (familial hemiplegic migraine) has been shown to have specific gene mutations that predispose to the patient's symptoms. Although migraine headaches have long been considered a benign (relatively harmless) condition, their symptoms may wreak havoc on a person's quality of life and ability to take part in normal life activities. Migraine pain is so intense that migraineurs often cannot think or function very well during or immediately following episodes. The symptoms of migraines interrupt normal activities in a majority of children who suffer from them. In one study of 970,000 self-reported migraineurs aged 6 to 18 years, 329,000 school days were lost per month. The sense of vulnerability of the sudden and unanticipated onset of migraine symptoms may cause emotional changes such as anxiety or sadness. Appropriate diagnosis and treatment of migraines can greatly improve quality of life for a person who suffers from migraine headaches. Studies suggest that migraine headaches occur in 5% to 10% of school-aged children in the United States This frequency gradually increases through adolescence and peaks at about 44 years of age. Many people experience spontaneous remission, meaning that the headaches go away on their own for no clear reason. The age of onset of migraine headaches is earlier in boys than in girls. From infancy to 7 years of age, boys are affected equally or slightly more than girls. The prevalence of migraines increases during the adolescent and young adult years. After menarche (the time when the first menstrual period occurs), a female predominance occurs. This continues to increase until middle age. The frequency of migraines declines in both sexes by 50 years of age. Most migraineurs begin to experience attacks before 20 years of age. Approximately 20% have their first attack before their fifth birthday. Preschool children experiencing a migraine attack usually look ill and have abdominal pain, vomiting, and a strong need to sleep. They may show pain by irritability, crying, rocking, or seeking a dark room in which to sleep. Older children tend to present with headache on one side of their skull. The headache location and intensity often change during or between attacks. Research has shown that many "sinus headaches" are really of migrainous origin. As children grow older, headache intensity and duration increases, and migraines begin to happen at more regular intervals. Older children also describe a pulsating or throbbing characteristic to their headaches. Headaches often shift to the one-sided temple location that most adult migraineurs report. Childhood migraines often stop for a few years after puberty. A headache may be a symptom of a benign (relatively harmless) condition, or it may be a life-threatening symptom. The patient's medical history and physical examination results are often enough to identify or rule out serious underlying problems or conditions. Testing (laboratory or imaging) is employed to support a suspected diagnosis. No specific laboratory or radiological test establishes the diagnosis of migraine headache. Doctors make the diagnosis through medical history, physical examination with emphasis on the neurological components, and clinical judgment. When considering a diagnosis of migraine headache, the doctor will ask about a child's medical history, previous tests, allergies, and current and previous medications. Children will be asked to describe how the headache feels (for example, throbbing, pounding, squeezing, pressing, pulsating, aching, burning, stabbing, dull). They will also be asked about the headache's location, timing, severity, causal events (for example, concussion, falling down), duration, and whether any relatives have migraine headaches. Other common historical evidence to support the diagnosis of migraine headache includes sensitivity to light and sound, tenderness in the scalp (usually where the pain is most severe) and a strong desire to lie down and sleep. Conditions that cause severe headaches in children include both primary and secondary disorders. The exact cause(s) of migraine headaches is unknown. Some migraines are thought to be due a temporary deficiency of the brain chemical serotonin. Many of the drugs effective in treating migraines target this chemical. Some migraineurs know that their headaches are triggered by something they eat, drink, or a particular activity. Migraines most likely have several trigger factors and multiple internal causes. Although many migraine disorders do not develop until middle age, early recognition of migraine risk factors may help a child adopt a healthy lifestyle. The doctor must find out which type of headache a child has, because the best treatments are different for each category. Headaches that come back again and again are usually the result of primary disorders. A physician evaluating a patient with headache must consider that a patient with a primary headache disorder may also have a secondary headache disorder. A migraine attack has four possible phases. These prodrome symptoms are often more evident in migraine without aura than in migraine with aura. Children with frequent migraine headaches or migraine variants often have a vague feeling that something is different in their world. They often learn to recognize these early signs but have trouble explaining or describing them to parents or health care practitioners. An aura is a focused symptom that happens right before a migraine headache or when one begins. An aura may occur without headache, or it may be more severe than the following migraine headache. Some children with migraine headaches experience auras; however, under- reporting may exist due to the inability of young patients to verbally explain their sensations. The aura usually occurs less than 30 minutes before the migraine headache and lasts for 5 to 20 minutes. Motor auras (those affecting a person's coordination) tend to last longer than other forms. Visual disturbances are the most common form of aura. Numbness and tingling of one side of the face and tingling of fingers on the same side are the second most common type of aura. Disorder of speech is a rare aura presentation. Complete recovery of aura symptoms should be expected. Children are often unable to recognize or describe their auras. Picture cards that show typical visual auras may help the doctor get an accurate history. Visual auras are often reported as moving or changing shapes and are the most common form in children. Aura symptoms can vary widely within and between attacks for the same individual. After the headache phase, the migraineur (person who has migraines) may feel elated and energized or, more typically, exhausted and lethargic (weary, tired) in the stage known as the postdrome. This stage of migraine may last from hours to days. Migraine with aura: This type of migraine, also known as classic migraine, is characterized by a visual or other type of aura followed by a unilateral (one-sided), throbbing headache, which may later spread to both sides. It lasts from half an hour to 48 hours. Migraine with aura occurs in 15% to 40% of children who experience migraine headaches. The typical aura is manifested by various abnormalities of the visual, auditory, and/or sensory systems. These symptoms are progressive in intensity, usually last for about 1 hour, and resolve completely. Common migraine: Common migraines lack an aura. Migraine without aura in children is traditionally described as a recurring (happening over and over), bilateral (two-sided) headache disorder with a throbbing and/or pulsating pain quality, moderate-to-severe intensity, and severe stomach symptoms. Common accompanying symptoms in children are irritability and paleness with dark circles under the eyes. In younger children, the pain is more often on both sides and around the eyes and temples. Migraine without aura occurs in a majority of migrainous children. Chronic migraine: Persons with chronic migraine have headache attacks at least 15 days of every month for at least 2 months. Chronic migraine may affect up to 4% of teenage girls and 2% of teenage boys. Status migrainosus: This is a severe form of migraine headache in which the attack is continuous over 72 hours. People who have such an attack usually have a history of migraine. In those who vomit, rehydration (restoring adequate fluid levels) is often the necessary first step in treatment. Complicated and variant migraines: These are classified as migraines because they often have the same triggers. They are brief, recurrent, episodic disorders that are made worse by physical activity and relieved by deep sleep or typical anti-migraine medications. Complicated and variant migraines cause some of the same symptoms as typical migraines, including pain, stomach problems, autonomic symptoms (for example, abnormal sweating, changes in pupil size), neurologic symptoms (for example, tingling, numbness, weakness), and changes in mood or emotion. These benign (relatively harmless) disorders are frightening because they often seem to be life-threatening emergency situations. Migraine equivalents are under-recognized and under-reported expressions of childhood migraine. They are often forerunners of the typical migraine, and complicated and variant migraines occasionally alternate with typical migraines. Listed below are examples of some of these variant migraine patterns. Familial hemiplegic migraine (FHM): FHM is an uncommon form of migraine with aura. Persons with FHM have long-lasting hemiplegia (paralysis of one side of the body) along with numbness, aphasia, and confusion. The hemiplegia may come before (as part of the aura), accompany, or follow the headache, and symptoms may last for hours or as long as a week. FHM is very rare and may run in families (usually another first- or second-degree relative is affected in these cases). The headache is usually opposite from the paralyzed side. Some cases of FHM are associated with cerebellar ataxia [a loss of muscle coordination caused by disorders of the cerebellum (a part of the brain)]. People with other types of severe FHM may experience coma, fever, and meningismus [pain caused by irritation of the membrane layers (meninges) surrounding the brain and spinal cord]. Another type of FHM involves progressive ataxia, nystagmus (uncontrollable, rapid horizontal or vertical movement of the eyeballs), clumsiness, and dysarthria (a speech disturbance due to emotional stress, to brain injury, or to paralysis, incoordination, or spasticity of the muscles used for speaking). A chromosomal marker has been demonstrated to be shared with patients who experience FHM. The significance of this observation is not fully understood. A history of typical migraine exists in a majority of families studied. Many people experience basilar migraine attacks intermingled with typical migraine attacks. Some children with migraine will suffer from basilar migraine. The most common age of onset is 7 years of age. Ophthalmoplegic migraine: This form of migraine is associated with paralysis of the extraocular muscles (muscles which control eyeball movement) and is rare. People with this type of migraine experience severe one-sided headaches. Ophthalmoplegia (paralysis of one or more of the eye muscles) may precede, accompany, or follow the headache. Retinal migraine: This is an extremely rare migraine type during which there is a unilateral (one-sided) sudden loss of vision preceded by a sensation of bright lights. A migraine headache generally follows within 1 hour of the visual impairment and is commonly on the same side as the affected eye. Full vision recovery is expected, and it is rare to have any permanent loss or impairment of vision. Benign paroxysmal vertigo of childhood: This condition is probably not a true migrainous disorder. It is the most frequent cause of vertigo in childhood and is characterized by brief episodes of vertigo, disequilibrium (poor balance), and nausea. Episodes tend to be brief, have a sudden onset, and may occur in clusters for several hours and then spontaneously stop. Children with this problem are usually aged 2 to 6 years. Nystagmus may occur during but not between attacks. Hearing loss, tinnitus, or loss of consciousness does not occur. Symptoms usually last only a few minutes. Parents observe that an attack is characterized by a sudden onset of fear, refusal to walk, or need to hold onto supporting structures for stability. They may have a sudden loss of alertness ("space out"). No headache occurs in benign paroxysmal vertigo. Children with benign paroxysmal vertigo often develop a more common form of true migraine as they mature. Acute confusional migraine: This type of migraine is characterized by short-lived episodes of amnesia (memory loss), confusion, agitation, lethargy, and dysphasia (speech difficulties) brought about by minor head trauma. The child may have aphasia, and the confusional state may either precede or follow the headache. Some children also experience recurrent episodes of temporary amnesia and confusion. Recovery almost always occurs within 6 hours. One report points out that brain CT studies of those whose migraine is associated with head trauma are normal. The child may not have a history of headache but usually develops typical migraine attacks at some point in the future. Migraine-associated cyclic vomiting syndrome (periodic syndrome): This syndrome is characterized by recurrent periods of intense vomiting separated by symptom-free intervals. Many people with cyclic vomiting have regular or cyclic patterns of illness. Symptoms usually come on quickly at night or in the early morning and last 6 to 48 hours. Associated symptoms include abdominal pain, nausea, retching, anorexia, paleness, lethargy, photophobia, phonophobia, and headache. Headache often does not appear until the child is older. Migraine-associated cyclic vomiting syndrome usually begins when the person is a toddler and disappears in adolescence or early adulthood. (It rarely begins in adulthood.) This syndrome affects more females than males. Infections, psychological or physical stress, and dietary triggers are often clearly associated. Examples of triggers include cheese, chocolate, monosodium glutamate (MSG), emotional stress, excitement, or infections. Usually, a family history of migraines in the parents or siblings is present. Children with this condition often need intravenous fluids. Abdominal migraine: The child may have recurrent bouts of generalized stomach pain with nausea and vomiting. No headache is present. After several hours, the child can sleep and later awakens feeling better. Abdominal migraine may alternate with typical migraine and usually leads to typical migraine as the child matures. Paroxysmal torticollis of infancy: Probably not a true migrainous condition, paroxysmal torticollis is manifested as a sustained contraction or shortening of the neck muscles. This rare disorder is characterized by repeated episodes of head tilting and is associated with nausea, vomiting, and headache. Attacks usually occur in infants and may last from hours to days. Acephalic migraine of childhood (migraine sine hemicrania): This condition is characterized by a migraine aura (usually visual) without headache. Females are more likely than males to have this type of migraine. Alice in Wonderland Syndrome: The syndrome is characterized by headache that is preceded by visual hallucinations or delusions, distortions of body image and abnormalities in the experience of time. Such experiences may wax and wane over several days to months, and children generally recover without residual problems. It is most commonly seen in the young school-aged child. Menstrual migraine: Menstrual migraine occurs in close approximation to the onset of menstruation and will commonly last for 2 to 3 days. 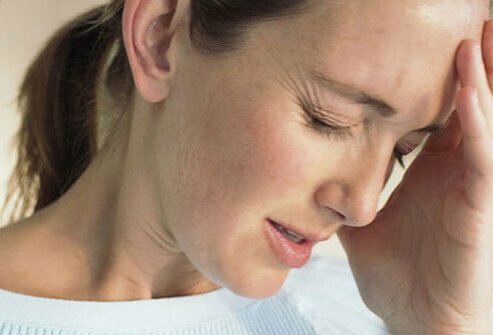 The cause of such migraine headaches has been postulated to be associated with the reduction of estrogen and progesterone levels that are associated with menses. No aura is appreciated with menstrual migraines. Women who suffer from menstrual migraines may also experience more traditional migraines (either with or without aura) at other times of their menstrual cycle. Many migraineurs report anxiety (excessive worrying) or sadness. Whether the headache or the mood or anxiety symptoms appear first is unclear. Epilepsy and migraine headaches often occur in the same person and may be related. About 70% of individuals with partial complex seizures have migraines, but most people with migraines do not have seizures. Migraineurs are more prone to motion sickness than people without migraine. Intermittent vertigo is found in many of people with classic migraine and in some of those with common migraine. A higher degree of cardiovascular reactivity to postural changes (blood circulation responses to standing or sitting) has been shown in those with cyclic vomiting and migraine. Diarrhea is common in migraineurs and is sometimes severe enough to cause excessive fluid loss and dehydration. Migraines are associated with sleep disturbances, and sleepwalking (somnambulism) is found in some of migraineurs. An aversion (dislike) of striped patterns is found in many tested migraineurs. One study found that eating ice cream caused headache in 93% of migraineurs and was typically located at the usual site of migraine pain. Parents should take children with severe headaches to see a doctor. The doctor will ensure that no life-threatening underlying condition is responsible. He or she will also provide a diagnosis, reassurance that no serious underlying illness is present, and a plan for effective pain treatment. Writing down specific questions before a medical appointment is a good idea. Parents should feel free to take notes and/or make an audio recording of the visit. The purpose of the first appointment is to find out what kind of headache the child has. If a diagnosis of migraine headache is confirmed, the doctor should spend time explaining exactly what that means for the child and for the parents or caregivers. Education is often the most important part of the visit. A review of potential trigger factors, how to treat the headache pain at the time of the attacks, and whether a preventive drug is needed are important issues that should be addressed. Doctors evaluate children who have headaches by performing a thorough general physical examination and a detailed neurologic examination (an examination of the brain and nerve functioning). All findings should be distinctly normal. Doctors perform or order appropriate additional evaluations and tests if the child has abnormal vital signs, nuchal rigidity (stiff neck), cranial nerve (nerves in the head) abnormalities, macrocephaly (an abnormally large head), bruits (abnormal body sounds), papilledema (swelling of the structures and tissues of the retina), cutaneous lesions (skin changes), cognitive (thinking) changes, or asymmetric signs (for example, weakness on one side of the body). The doctor will order laboratory studies (lab tests) to rule out other causes for those people with headache that might have a non-migrainous reason for their headaches. Typically, imaging studies are unnecessary in children with a long-term (more than 6 months) history of headaches, normal neurologic examination results, and no seizures. An abnormal imaging result is very rare in a person meeting these criteria. The doctor will consider imaging studies in everyone with a history of seizures, recent head injury, significant change in the character of the headache, focused brain/spinal cord/nerve deficits, or papilledema (swelling of the structures and tissues of the retina). A lumbar puncture (spinal tap) will probably be performed if the doctor suspects meningitis (inflammation of the membranes of the brain and/or spinal cord), encephalitis (inflammation of the brain), subarachnoid hemorrhage (bleeding in the brain membranes), or certain other conditions. There are a variety of treatments for migraine headaches in children including self-care measures and medications. Sleep is the best treatment for a migraine. Sleep restores normal brain function, relieves pain, and resolves many associated migraine symptoms. Doctor-prescribed or recommended pain-relieving drugs should be given to the child migraineur. Medical treatment of migraine headaches in children is based on the following: (1) education of children and parents or caregivers about migraine triggers, (2) creation of a plan of immediate treatment for the attacks, and (3) consideration of preventive medicines or measures for children with frequent migraines. The doctor should explain the disease to the child and the parents or caregivers. The treatment of children with mild, infrequent migraine attacks consists mainly of rest, trigger avoidance, and stress reduction. The doctor should also assure parents that the headache is not caused by a brain tumor or other life-threatening condition. A regular bedtime, strict meal schedules, and not overloading the child with too many activities are important. Helping the child recognize migraine triggers is helpful but often difficult. Ridding migraine triggers reduces the frequency of headaches in some children but does not completely stop occurrences. Unfortunately, even the most diligent person cannot always identify specific migraine triggers. At the time of attack, parents or caregivers should have the child lie down in a cool, dark, quiet room to help him or her fall asleep. In spite of the development of many effective anti-migraine medications, sleep is the most powerful and best treatment. During a migrainous attack, a child can often be found resting in the fetal position with the affected side of the head down. Some children find that ice or pressure on the affected artery can reduce pain for a short time. Nonsteroidal anti-inflammatory drugs (NSAIDs) are effective if taken at a high but appropriate dose during the aura or early headache phase. Common over-the-counter (OTC) NSAIDs include ibuprofen (Advil, Children's Advil/Motrin, etc.) and naproxen (Aleve, Naprosyn, Anaprox, Naprelan). Acetaminophen (Tylenol and others) may also be used for pain control. Aspirin should not be used in children or adolescents. Digestion temporarily slows or stops during migraine attacks, delaying absorption of oral medications. Occasionally, carbonated beverages may improve absorption. Other treatment methods, such as self-relaxation, biofeedback, and self-hypnosis, may be reasonable alternatives to drug therapies in childhood migraine, particularly in adolescents. Response rates in children tend to be higher than in adults and show continued effectiveness over time. The primary goals of preventive therapy are to prevent migraine attacks and to reduce the frequency and severity of attacks. Most preventive migraine medications have potential side effects, so only children with at least one to two attacks per week should take them. Parents and caregivers should have realistic expectations. While medications lessen the impact of migraines, they do not resolve the underlying causes and they will not completely eliminate all migraines. Half of all patients experience a 50% reduction in migraines (at most). Tyramine: Individuals with low levels of a substance called phenol sulfotransferase P are believed to be sensitive to dietary monoamines (a type of molecule) such as tyramine and phenylethylamine. Cultured dairy products (for example, aged cheese, sour cream, buttermilk), chocolate, and citrus fruits are believed to cause vasodilation (widening of the blood vessels) in certain people. Some migraines may be triggered by artificial sweeteners. Beverages: Alcoholic beverages (especially red wine) and excess of or withdrawal from caffeinated drinks such as coffee, tea, cocoa, or colas may trigger a migraine headache. Migraineurs should limit caffeinated sources to no more than two cups per day to prevent caffeine-withdrawal headaches. Caffeine can be found in chocolate-containing foods and candies; therefore, children with migraines should avoid them. Nitrates and nitrites: These vasodilating agents are found in preserved meats. Examples of foods containing these chemicals include lunch meats, processed meats, smoked fish, sausage, pork and beans with bacon, sausage, salami, pastrami, liverwurst, hotdogs, ham, corned beef, corn dogs, beef jerky, bratwurst, and bacon. Monosodium glutamate (MSG): MSG is a flavor enhancer and vasodilator found in many processed foods. Food labels should be checked carefully. MSG sources include Accent seasoning, bacon bits, baking mixtures, basted turkey, bouillon cubes, chips (potato, corn), croutons, dry-roasted peanuts, breaded foods, frozen dinners, gelatins, certain Asian foods and soy sauce, pot pies, relishes, salad dressing, soups, and yeast extract. Citrus fruits, avocados, bananas, raisins, and plums: These foods may be triggers. Although few individuals are sensitive to fruit, children with migraines should still eat a well-rounded, natural diet that includes fruits and vegetables and avoid processed foods. A headache diary may be helpful (a pattern often emerges after 6 to 8 weeks). Care must be taken to avoid creating an unnaturally limited diet that harms a child's growth and development. Both OTC and prescription medications can trigger or worsen migraine headaches. Cimetidine (Tagamet), estrogen (Premarin), histamine, hydralazine (Apresoline), nifedipine (Procardia), nitroglycerin (Nitro-bid), ranitidine (Zantac), and reserpine (Serpasil) are examples of medications that can increase migraine frequency. Excessive use of OTC pain medications and analgesics can cause occasional migraine attacks to convert to analgesic-abuse headaches or drug-induced headaches that do not respond to treatment. Children with migraines should avoid frequent or long-term use of NSAIDs, acetaminophen, triptans, or ergotamines. Migraineurs who have been treated for a long time with amphetamines (Biphetamine), phenothiazine (a type of antihistamine), or propranolol (Inderal) should avoid sudden withdrawal from these medications because migraine headaches may result. In children who have an inborn tendency for migraine headaches, attacks can occur as a result of psychological (emotional), physiological (internal body processes), or environmental triggers. Physical exertion and travel or motion can be triggers. Psychological triggers: These include stress, anxiety, worry, depression, and sadness. Migraine headaches are not an imagined or psychological illness. Stress makes an underlying tendency for migraine more difficult to manage. The frequency of migraines can be reduced but not eliminated by maintaining a healthy lifestyle. Physiological triggers: These include fever or illness and not getting adequate food, rest, or sleep. Children with migraines should stick to a routine with regular meal times and adequate sleep. Environmental triggers: These include fluorescent light, bright light, flickering light, fatigue, barometric pressure changes, high altitude, strong odors, computer screens, or rapid temperature changes. Some migraineurs report that complex visual patterns like stripes, checks, or zigzag lines trigger their migraines. Physical exertion: Activity can trigger childhood migraine. Some migraineurs report that they are more likely to get a headache after participating in sports or being extremely active. Minor head trauma (for example, being hit in the head with a ball, falling on one's head) may also result in a migraine attack. Travel or motion: This may cause migraine, particularly in young children. If headaches cannot be reasonably controlled within 6 months, the child should see a pediatric neurologist (a physician specializing in the treatment of brain/nerve disorders). Children who suddenly develop new neurologic problems such as weakness, thinking difficulties, or seizures, should also see a pediatric neurologist. Analgesic and abortive therapies are for the treatment of occasional severe headache attacks and related symptoms. Analgesic and abortive medications should not be used frequently (that is, more than two times per week) because they may cause rebound headaches when children stop taking them. In general, the earlier in an attack the pain is treated, the less severe the pain becomes. The longer the wait before starting therapy, the more difficult the pain is to control. Established migraines are notoriously difficult to treat successfully. Digestion temporarily slows or stops during migraine attacks, delaying absorption of oral medications. In addition to drug therapy approaches, other approaches to reducing the severity of many childhood migraines include avoiding sensory stimulation (for example, bright lights, intense odors), applying ice packs, and resting in a quiet, dark room. Preventive medications are taken on a daily basis over a long period of time to reduce the frequency or severity of headaches and associated symptoms. None of the preventive medications are 100% effective in preventing all attacks. A good response to preventive medications is a 50% reduction in the frequency or severity of attacks. Children should not be given these drugs unless they have frequent (more than two per week), prolonged, and disabling migraine attacks that do not respond to other treatments. Often, several weeks are necessary before improvement is observed. Some child migraineurs must be kept on long-term preventive therapy, while others tolerate drug "holidays," particularly during summer, when migraines are less frequent for many children. Occasionally, these drugs lose their effectiveness after initially helping the child. Using the same drug later is often not very effective. Different drugs work better for different people; therefore, several may have to be tried before finding the best drug for a particular child. Preventive drugs should be withdrawn slowly to avoid relapse and withdrawal symptoms. The following drugs are used to treat quickly stop migraine headaches in mid attack. They have little preventive value. The first group is the "triptans," which specifically target serotonin. They are all chemically very similar, and their action is similar. The following drugs are also specific and affect serotonin levels, but they affect other brain chemicals as well. Occasionally, one of these drugs works when a triptan does not. Children with status migrainosus (a severe form of migraine headache in which the attack is continuous over 72 hours) can be treated in an emergency department or a doctor's office with intravenous or intramuscular medications. Doctors sometimes cannot be absolutely certain that a child has migraines, or they may suspect that he or she has a headache condition caused by an underlying neurologic disease. Such children should have appropriate follow-up care, so that they can be observed over time. In children with an inborn tendency for migraine, minor head trauma may worsen the headaches, typically for a period of days to months. If this occurs, parents should make a follow-up appointment. A follow-up appointment is also needed if the headaches worsen, if they do not respond to medications, or if drug side effects are intolerable. Several medication trials are often necessary before adequate headache control is achieved. In one of the few long-term studies of migraine patients, a Scandinavian researcher named Bille observed 73 Swedish children with migraine. He followed these children for 40 years. On average, they started to have migraines at age 6 years. During puberty or young adulthood, 62% of the children were migraine-free for at least 2 years. About 33% started to have regular attacks again after an average of 6 migraine-free years, and a surprising 60% of the original 73 children still had migraines after 30 years. In 30 years, 22% of the children never had a migraine-free year. "Preventive treatment of migraine in children"
"Classification of migraine in children"
"Acute treatment of migraine in children"
"Pathophysiology, clinical features, and diagnosis of migraine in children"
What treatment were effective for your child's migraine headaches?